We asked Clare Walters, one of our MA in Children’s Literature alumna, to write about her experience auditing the Time and History module taught by Dr Lisa Sainsbury in Spring 2015. The module began with a discussion of what might be meant by ‘historical fiction’. We loosely defined it as books that, at the time they were published, engaged with the past, often mixing in real historical characters with fictional ones. We noted that the nineteenth century texts – The Children of the New Forest and Kidnapped – reflected a fairly stable view of British history, but acknowledged that these books are now viewed in a different light. They are ‘doubly’ historical in that, being read years after first publication, they can reveal more about the time they were written than the period they describe. This was true even of the mid-twentieth century novel The Eagle of the Ninth. A number of questions were posed of each text. Could a particular ideological framework could be identified, or a didactic purpose revealed? Were authenticity and accuracy of primary importance? And who was the implied reader? We applied these questions to fictional histories, too – those first-person novels where the narrative framework relies on an individual’s (potentially unreliable) memory, such as The Stonebook Quartet, Issac Campion and Code Name Verity. We discussed the inclusion of historical objects in fiction and asked whether these could provide continuity to the present; and we debated the role of images in the historical picturebook Rose Blanche. Around Week Five the focus changed to the time-slip novels Charlotte Sometimes, A Stitch in Time and Midwinterblood, where the action shifts between various time frames. In these books less emphasis is placed on the historical and more on the personal. The text becomes an emotional dialogue between past and present, and there is often interplay between a linear structure of time (chronos), and a more mythical sense of time, in which significant moments repeat themselves (kairos). The deadline for applications for the Jacqueline Wilson Scholarship is approaching! The University of Roehampton is pleased to make its annual Jacqueline Wilson Scholarship open to a general call for research topics in the field of children’s literature. This will be awarded to a postgraduate PhD student working in the field of children’s literature or creative writing for children. 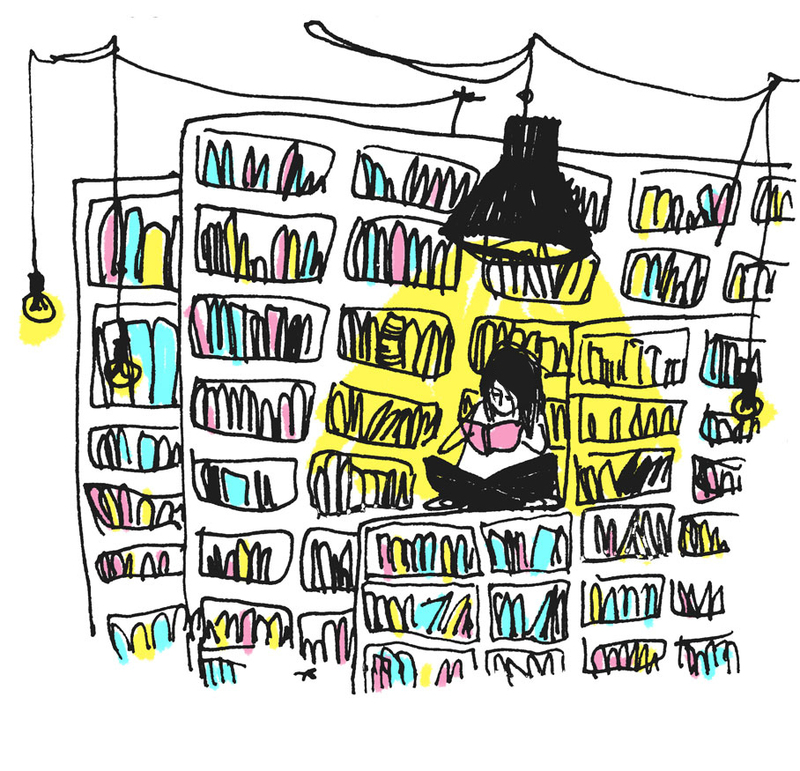 The Jacqueline Wilson Scholar will be based in the award-winning National Centre for Research in Children’s Literature (NCRCL) with access to the Children’s Literature Collection and archives, and will join a lively community of researchers, writers and students. This fully funded scholarship will cover home/EU fees of £4052 for Home/EU students and maintenance of £16,057 p.a. in 2015/16 for 3 years full-time subject to satisfactory progress. The scholarship is open to new students only and preference may be given to proposals that build on the research interests of the NCRCL. These include, but are not limited to: philosophy; theory; historical fiction; landscape; domestic spaces; memory; reading. Applicants are encouraged to identify potential supervisors as part of their application. Application packs can be found here. To apply, please complete a PhD Application Form and email your application, along with transcripts and letters of reference, to pgrscholarships@roehampton.ac.uk. Please mention in your covering email that you are applying for the Jacqueline Wilson Scholarship. To those visiting Roehampton University campus for the first time on 30thMay, the prospect of a talk on ‘mapping nonsense’ might have seemed apt, as building works required a circuitous route to be navigated to the car park. But the welcome at Duchesne building was, as always, warm and friendly for current and prospective students and alumni. A brief coffee provided an energy boost to those of us who’d enjoyed an early start, and we moved into the lecture theatre where Lisa Sainsbury, on-site convener of the MA in Children’s Literature, introduced Olga Holownia (University of Iceland). Olga’s talk: ‘An Island made of water quite surrounded by earth’. Mapping out the seascape of nonsense literature took us on a journey through the works of children’s authors renowned for their nonsense writing, including Lear and Gorey, but with a focus on the illustrations that accompanied and enhanced their work. In particular, Olga looked at the use of maps, through which we attempt to structure our interpretation of a story, to make ‘sense’of ‘nonsense’ as it were. But even though the components of nonsense literature can be defined, as by Wim Tigges in his An Anatomy of Literary Nonsense, its very nature means that it is imprecise, playing with boundaries and subverting expectations. Olga’s visual voyage of images, rhymes, and ideas finished with a trip through the maelstrom, to arrive at a second coffee break. Kathy with her poster on dystopian YA fiction. This offered the opportunity to look at the Poster presentations created by current MA dissertation students: several were in attendance to discuss their research. With themes as diverse as dystopian Young Adult fiction, Harry Potter, and dogs in mythology it provided an insight for those considering the MA into the multiple directions in which the course can take you. Students answered questions from staff and visitors, including describing their research to author and Roehampton Chancellor, Professor Dame Jacqueline Wilson – who was to be the next speaker of the day. A brief reminder that the deadline for the call for papers for the 22nd annual NCRCL MA/IBBY UK Conference is fast approaching! The deadline for proposals is Wednesday 24th June 2015. The conference will be held on Saturday 14th November 2015 at Froebel College, University of Roehampton. The title for this year’s conference is: Steering the Craft: navigating the process of creating children’s books in the 21st century. More details are available on the blog and proposals are welcomed from interested academics, authors, illustrators, publishers etc. in any of these areas. Please email a 200-word abstract (for a 20-minute paper), along with a short biography and affiliation to: Julia.Noyce@roehampton.ac.uk. Deadline Extended: Tuesday 7th July 2015. Eleanor Hamblen was awarded the Pinsent prize for outstanding work on the onsite programme. Elle’s coursework was of a very high standard overall but her it was her dissertation – entitled “Closer to Nature: miniature fantasies and environmental values in the work of Steve Augarde and Timothée de Fombelle” – was especially brilliant. On the surface, the dissertation was a straightforward comparison between the Touchstone trilogy (The Various 2003, Celandine 2005, Winter Wood 2008) by British author and illustrator Steve Augarde and the Tobie Lolness duology (La Vie Suspendue 2006, Les Yeux d’Elisha 2007) but Elle’s research revealed the many subtleties in these texts and showed that miniature children’s literature can convey complex environmental values. Elle showed that while Augarde’s and de Fombelle’s work emerges from very different fantasy traditions, both authors use miniature characters and miniature worlds to examine wider issues of ecological crisis and environmental responsibility. As well as balancing theoretical engagement with careful close-readings of texts and illustrations, Elle provided her own translations of de Fombelle’s work. As a result, the dissertation really showcased Elle’s skills, allowing her to build on the critical skills honed through the taught modules on the MA programme and draw on her own areas of expertise and experience. The result was a sophisticated and impressive piece of work. 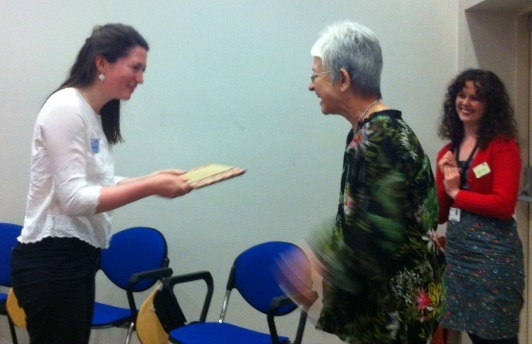 Elle receives her award from Chancellor Jacqueline Wilson. From Sinead Moriarty and Anne Malewski, organisers and PhD students with NCRCL: You are warmly invited to the annual PhD day of the NCRCL on Wednesday 17th June 2015. Find out about our centre and current doctoral research & meet staff and students. There will also be an exhibition & a children’s literature bake-off! 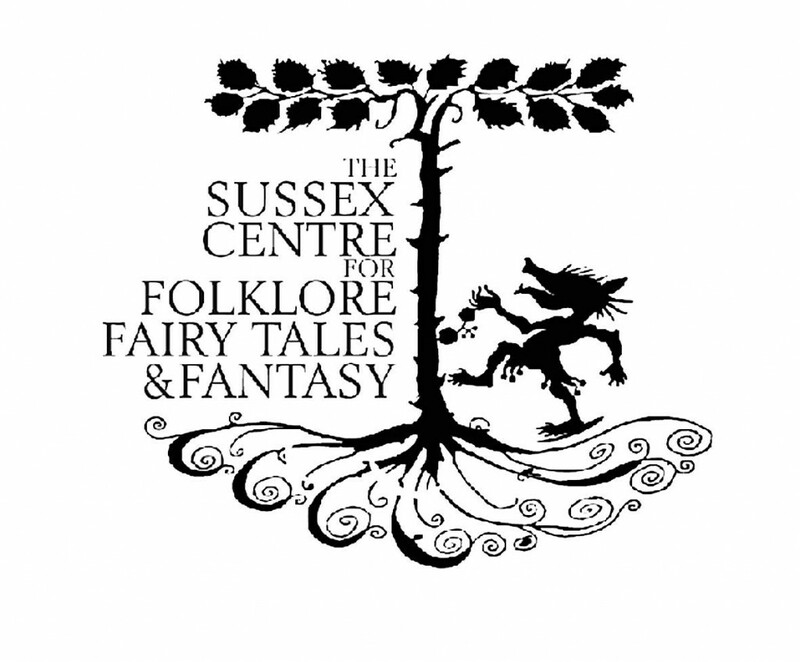 NCRCL PhD student, Nick Campbell, spoke at the Wonderlands Symposium at on 23rd May 2015, an annual event organised by the Sussex Centre for Folklore, Fairytales and Fantasy. He writes about his experience at the symposium below. The Sixth Annual Symposium to be run by the Sussex Centre for Folklore, Fairytales and Fantasy (based at the University of Chichester) invoked all sorts of interesting characters: from the Prophet Muhammad’s adventuresome Uncle to lawless types in the English greenwood; from ‘loathly ladies’ who are actually fairy queens in disguise to a Victorian girl and her famous adventures underground. In fact, as the event’s title suggests, there was an emphasis Alice and her ‘Wonderland’, celebrating their 150th anniversary this year. Papers covered curation of Alice exhibitions and creation of an Alice Tarot deck, as well as an illustrated keynote talk by the artist John Vernon Lord, whose Giant Jam Sandwich is legendary in the Campbell household, and whose take on the Alice books is an evocation of the dream state so scrupulous that the dreamer herself is unseen yet omnipresent. The idea of ‘Wonder-land’ itself was the major theme. Mary-Louise Maynes’ work on children’s responses to works like North: The Amazing Story of Arctic Navigation questioned whether non-fiction always had to place actuality and imagination in opposition. Mightn’t they instead inspire a critical, even storytelling approach from readers: a state of wondering about the land, as well as a state of wonder?